Easter falls on 21st April this year, as we will enjoy celebrating this joyful occasion, as well as marking the journey to the cross. Click here for Easter Services, or look on the tab above. Don't forget our family Easter fun with an egg hunt and Easter craft - click here for details. New for 2019! Breakfast Church has launched and continues on its tour around the six communities in the parish, stopping this month at Mersham Church on Saturday 27th April from 9:15-10:45am. 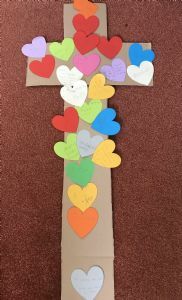 Family fun- craft, story, interactive prayer- and of course breakfast! We will be exploring St George and the Dragon, who will also feature on the 28th April at 3pm in our St George Parade and Party Church in Sellindge. As usual, there’s coffee mornings, Knit and Knatter, Fridays@3, Craft mornings, film night… have a look at the diary (to be uploaded vey soon). Please do get in touch if you need a lift- and you're welcome to bring a friend or two. We do have a variety of services across our Parish led by a talented team of lay leaders, in addition to the Communion services. Again, have a look at the diary, and if you need a lift , please get in touch. The APCM (Annual Parochial Church Meeting)- where you can find out what has been happening and where we are going in the Stour Downs Parish, as well as the finances and election of wardens and PCC members- will take place on Thursday 25th April at 7pm in Sellindge School Hall. Email office@stourdowns.org.uk for further details of any events.